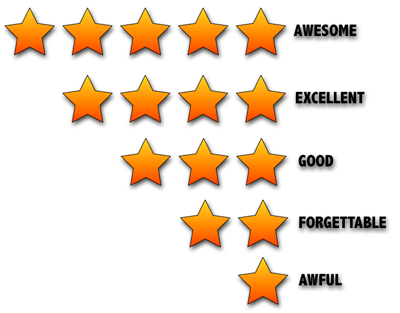 We’re not really fans of “ratings”, but we figured a rating system could be an additional tool to help summarizing our reviews at a glance. The star rating system is meant to be a signpost, not more. That’s why the rating can be found at the end of a review only. As GONIN means Five we will award truly outstanding films with five stars whereas the worst of the worst will receive only one. It goes without saying that the respective category of stars is a rough guideline only. E.g., many movies may barely make it into the awarded category, others may stop short of getting into a higher category. So 1 star may mean “1 1/2” stars and so forth. Also it is important to mention that two movies awarded with the same category of stars probably have earned the stars for very different reasons. So we do compare apples to oranges when we award the same category of stars to two entirely different films, and hence we are not saying that respective works are in any way comparable.